What is the task of the Artist? One answer is Joseph Conrad’s: “I want to make you see,” which to me means a clarity of perception, a heightened awareness of patterns and details never before observed. I applaud that, but my parallel idea may strike some as more sentimental: that the Artist’s job / chosen path is to make the world more beautiful, to bring beauty where there was none a moment before. 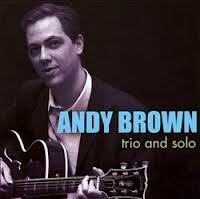 In these two quests, guitarist Andy Brown succeeds wonderfully. When he is playing the most familiar melody, we hear it in ways we had never thought of before — not by his abstracting or fracturing it, but because of his affection for its wide possibilities. And we go away from a note, a chord, a chorus, a whole performance, feeling that Andy has improved our world. He is obviously “not just another jazz guitarist” in a world full of men and women with cases, picks, extra strings, and amplifiers. For one thing, he is devoted to Melody — understated but memorable. He likes to recognize the tune and makes sure that we can, also. This doesn’t mean he is unadventurous, turning out chorus after chorus of sweet cotton for our ears. No. But he works from within, and is not afraid to apply old-fashioned loving techniques. A beautiful sound on the instrument. Space between well-chosen notes and chords. An approach that caresses rather than overwhelms. Swing. A careful approach to constructing a performance. Wit without jokiness. Medium tempos and sweet songs. His TRIO AND SOLO CD — pictured above — offers a great deal of variety: a groovy blues, a Johnny Hodges original, Latin classics, a George Van Eps original, some Thirties songs that haven’t gotten dated, a nod to Nat Cole, and more. Although many of the songs chosen here are in some way “familiar,” this isn’t a CD of GUITAR’S GREATEST HITS, or the most popular songs requested at weddings. Heavens, not at all. But Andy makes these songs flow and shine — in the most fetching ways — with logical, heartfelt playing that so beautifully mixes sound and silence, single-string passages and ringing chords. In the trio set, he is wonderfully accompanied by bassist John Vinsel and drummer Mike Schlick — and I mean “accompanied” in the most loving sense, as if Andy, John, and Mike were strolling down a country lane, happily unified. The CD is great music throughout. 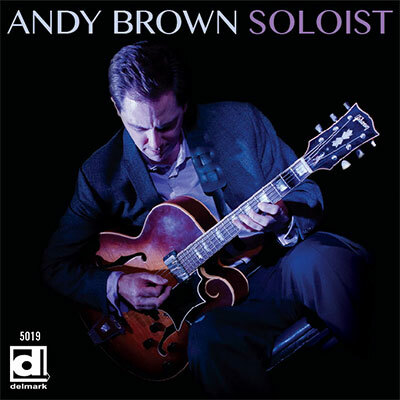 You’ll hear echoes of great players — I thought of Farlow, Van Eps, Kessel, Ellis, and others — but all of the influences come together into Andy Brown, recognizable and singular. And he’s also one of those players who is remarkably mature although he is years from Social Security. We hops he will add beauty to our world for decades to come. To hear more from this CD — rather generous musical excerpts — click here. To see Andy in videos, try this.